Each story of healing, hope, and empowerment is a testament to the impact of your support, which makes Wounded Warrior Project ® programs possible. 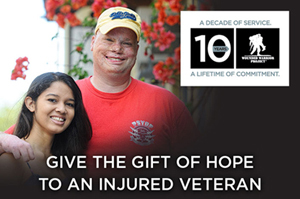 Give the gift of hope this holiday season — make a tax deductible gift to Wounded Warrior Project. Your generous donation to WWP enables us to help thousands of injured warriors returning home from the current conflicts and to provide assistance to their families.